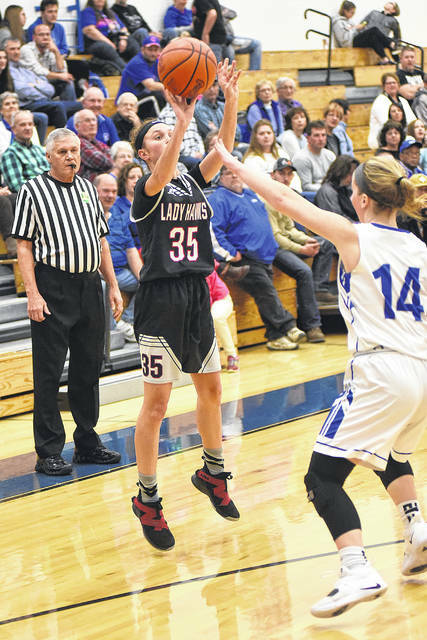 Franklin-Monroe junior Corina Conley joined the 1,000-point club with this shot in a game against Mississinawa Valley on Thursday. Conley finished the game with 22 points and now sits at 1,017 points for her career. 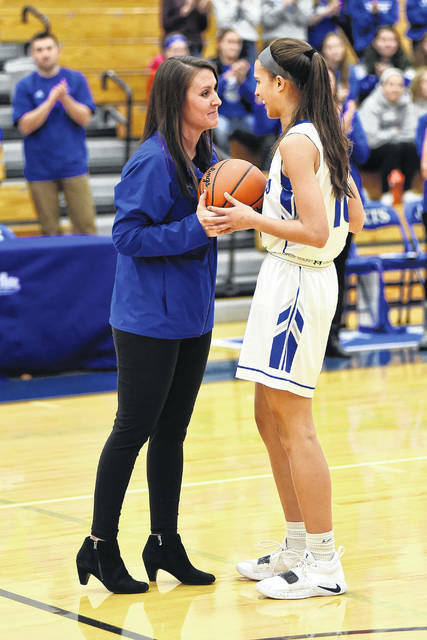 Franklin-Monroe junior Corina Conley is presented the game ball after scoring her 1,000th career point in a game against Mississinawa Valley on Thursday. Conley finished the game with 22 points and now sits at 1,017 points for her career. Franklin-Monroe junior Corina Conley posed for pictures with her family after a game with Mississinawa Valley on Thursday in which she scored her 1,000th career point. Conley finished the game with 22 points and now sits at 1,017 points for her career. The Franklin-Monroe girls basketball team honored its only senior prior to a game with Mississinawa Valley on Thursday. 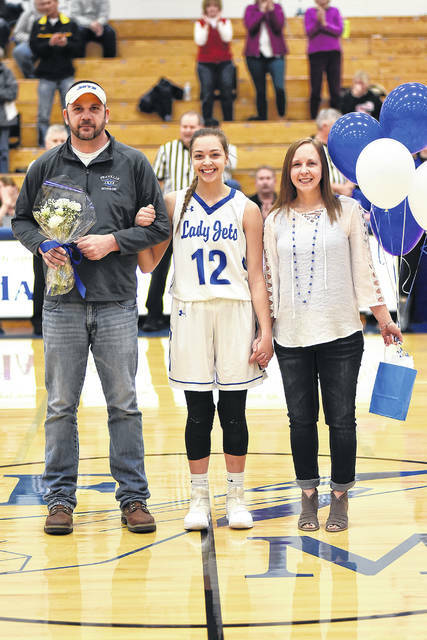 Kennedy Morris is pictured with her parents Mike and Amanda Morris. 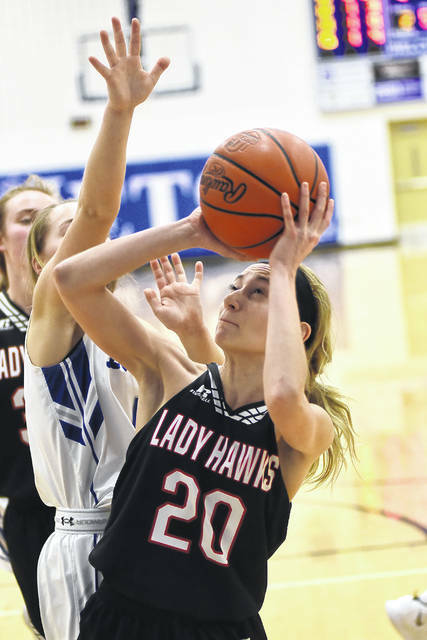 Mississinawa Valley’s Bailey Johnson tries to shoot over Franklin-Monroe’s Chloe McGlinch during their game on Thursday. The Lady Jets won the game, 65-9. 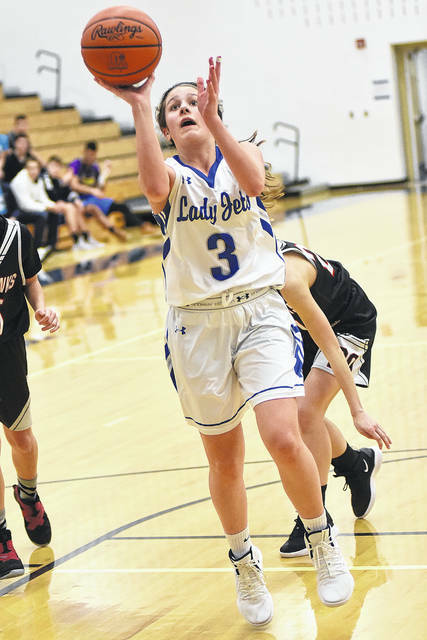 Franklin-Monroe’s Belle Cable throws up a left-handed shot during a game with Mississinawa Valley on Thursday. The Lady Jets won the game, 65-9. Franklin-Monroe’s Chloe McGlinch takes a shot from underneath the basket during a game against Mississinawa Valley on Thursday. The Lady Jets won the game, 65-9. Franklin-Monroe’s Corina Conley scores two of her game-high 22 points during a game against Mississinawa Valley on Thursday. The Lady Jets won the game, 65-9. 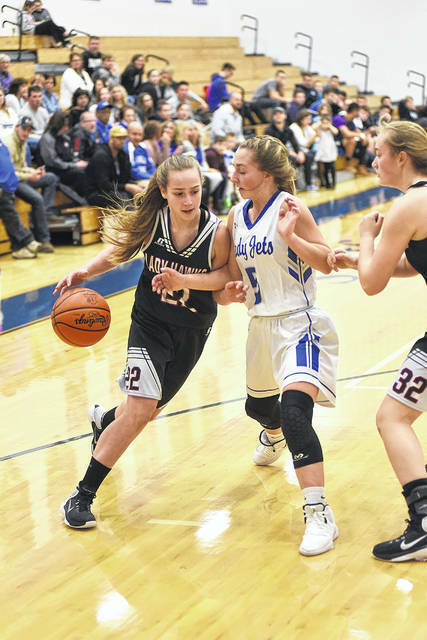 Mississinawa Valley’s Kennedy Stachler tries to get around FM’s Belle Cable during their game on Thursday. The Lady Jets won the game, 65-9. 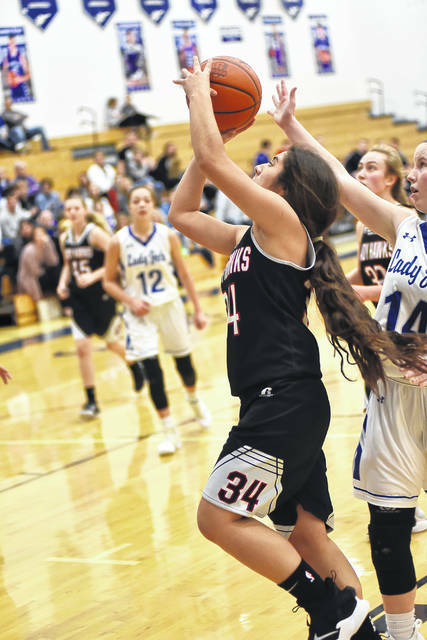 Mississinawa Valley’s Mattie Hiestand attempts a 3-point shot with FM’s Stella Shellabarger on defense during their game on Thursday. The Lady Jets won the game, 65-9. Mississinawa Valley’s Olivia Caixba goes in for a layup during a game at Franklin-Monroe on Thursday. The Lady Jets won the game, 65-9. Mississinawa Valley’s Olivia Murphy takers a shot from underneath the basket during a game at Franklin-Monroe on Thursday. The Lady Jets won the game, 65-9. Franklin-Monroe’s Skylar Bauman gets off a shot from in front of the basket during a game against Mississinawa Valley on Thursday. The Lady Jets won the game, 65-9. Franklin-Monroe’s Stella Shellabarger takes a jump shot during a game against Mississinawa Valley on Thursday. The Lady Jets won the game, 65-9. 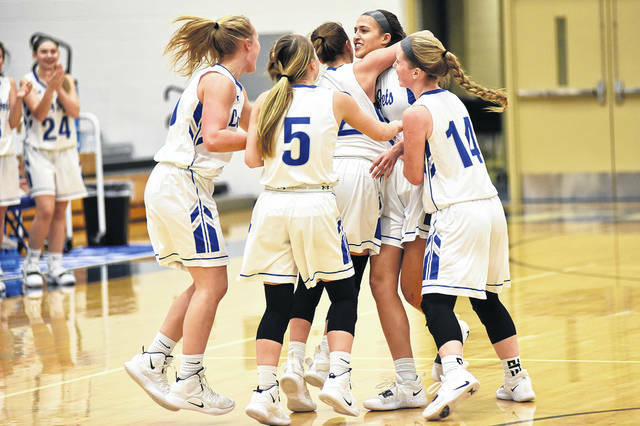 The Franklin-Monroe girls basketball team mobs junior Corina Conely after she scored her 1,000th career point during the early minutes of a game against Mississinawa Valley on Thursday. The Lady Jets won the game, 65-9. 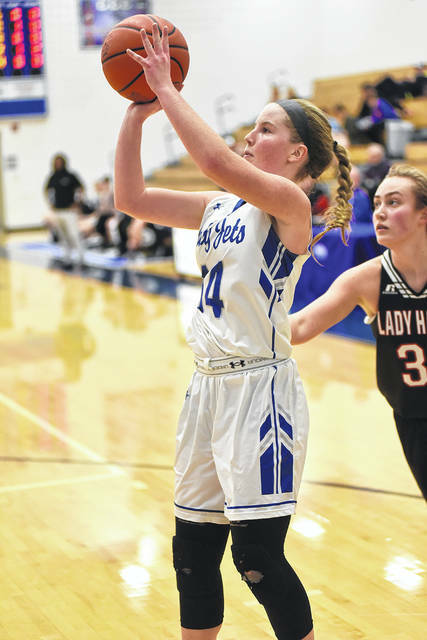 PITSBURG – The game between Franklin-Monroe and Mississinawa Valley girls was never competitive and the outcome never in question with the home team winning by the score of 65-9, but it did provide some high moments and low moments along the way. Prior to the game FM honored its lone senior on the squad, Kennedy Morris. Kennedy is the daughter of Mike and Amanda Morris and is a 4-year starter on the basketball team. She also is 4-year volleyball player and an outstanding softball player. Her plans are to become an EMT, and when she’s 21 to join the Police Academy. Franklin-Monroe jumped out in front of Mississinawa early going up 18-0 in the first quarter and 37-2 by the end of the first half. 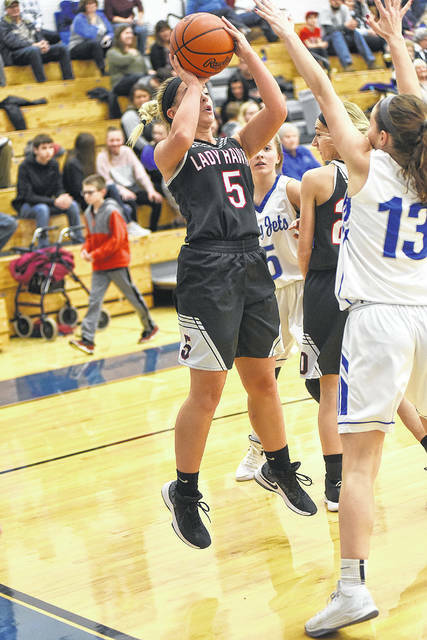 The Blackhawks were missing the production of their senior leader Sidnie Hunt, who went down in the Fort Recovery game. The loss of her points along with 12 rebounds per game was evident in the game. 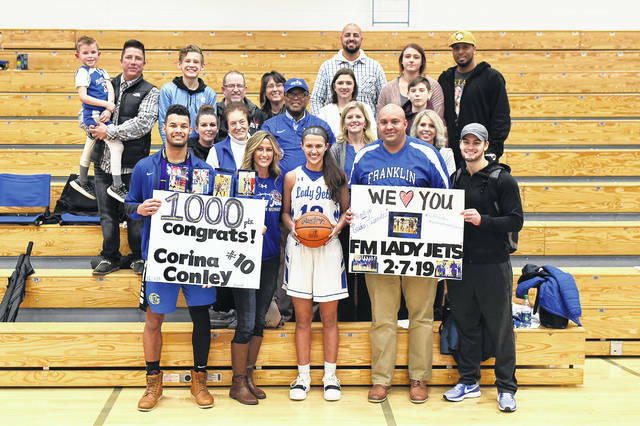 It turned out to be a very special night for Franklin-Monroe junior wing player Corina Conley. Coming into the game she needed 5 points to reach a 1,000 for her career. Folks were sitting on the edge of their seats aware of the moment, everyone except Corina, who was unaware she was so close to the milestone. Sitting on 999 points the lanky guard took aim from beyond the arch on the right wing next to the visitors bench and released a high arching shot that rippled the nets for point numbers 1,000, 1,001 and 1,002. 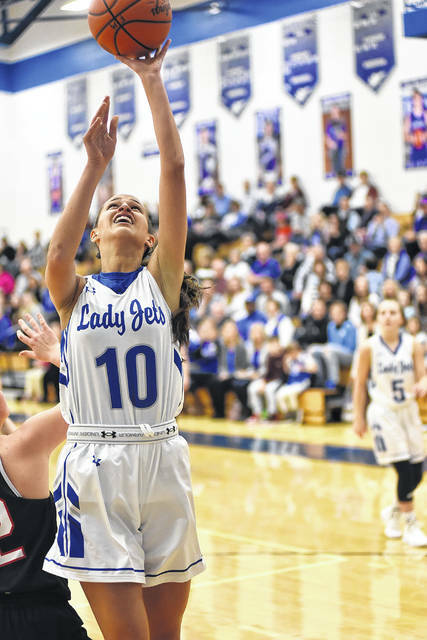 She was soon mobbed by her starting teammates on the floor and the look on her face was one of disbelief and all smiles as the game was stopped and the announcement made. Coach Abbey Moore then presented her with the game ball. After the game she had this to say about the moment. “She deserves everything that comes her way with all the hard work she puts in. To achieve this accomplishment as a junior is very impressive. Impressive not only as a basketball player, but as a person. She’s such a great kid and I kind of lose words when I start to talk about her because of everything she does and the kind of person and human being she is,” Moore praised. “A big credit goes to her teammates for putting her in positions where she gets good looks and she would be the first to tell you that,” Moore stated. “We had that moment when I gave her the basketball and then I said, ‘Go hug your mom and dad, tell them thank you,’ because they are a big reason why she’s where she is today. It wouldn’t be possible without them. It was special for me to have that moment with her, especially since she didn’t know it, and even better to see her reaction. But that’s her, she is so unselfish and always thinking about the other person,” Moore added. That unselfishness was apparent when talking with Corina after the game. “I had no clue, no idea at all, I was hoping to get a 1,000 points this year and was thinking maybe it would happen in the tournament, but my focus all along has been about getting wins,” Conley stated. Conley, who was averaging around 14 points a game earlier in the year, has stepped up her production on the offensive end of the floor. She has been scoring around 19 the last half of the year and when asked what changed, she had this to say. “Well as you know we have had a lot of adversity this year and we’ve worked so hard in practice to overcome it. I feel like my confidence has gotten much better as we’ve gone through this process, it also helps that my teammates get me the ball where I can score it. They are amazing teammates and I wouldn’t trade them for anything,” Conley stated. Conley has predominately been a post player most of her career, but more recently has taken on more of a role as a wing player and getting a lot more shots up from the perimeter which seems to account for her increased scoring production. “This year I’ve really focused on my outside game and taken on more of a role as a guard. I work on that every day in practice. I really want to play in college and although I’m tall, I’m not really tall enough to be a post player, so I need to expand my game to be a better ball handler and scorer from the outside to play at the next level and coach (Abbey Moore) has worked with me, to help that development and she has been really supportive in helping me improve in that area and so have my teammates.” Conley said. Corina was all smiles and mentioned how much love her family has for the game of basketball and all the support she gets, not only her mom and dad, brothers Mason and Ethan, but all the extended family and Jet nation and how much that means to her. “This is a true honor for me to reach this milestone and to join the 1,000-point club with my mom and Ethan,” Conley concluded. Conley did play some in the third quarter and she ended the game with 22 points to put her career total at 1,017 and counting. 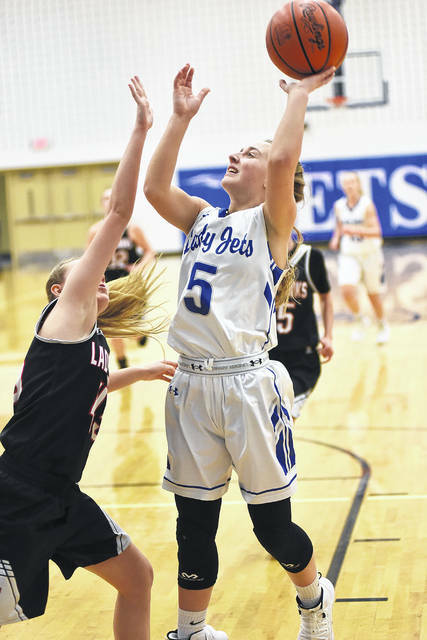 Belle Cable added 14 points, freshman Skylar Bauman 9 and Chloe Peters 8 for the Jets. Mississinawa Valley falls 2-19 overall and 1-11 in the Cross County Conference. They will play Fort Loramie in the Division IV sectional at 6:30 p.m. on Tuesday, Feb. 19 in Sidney. 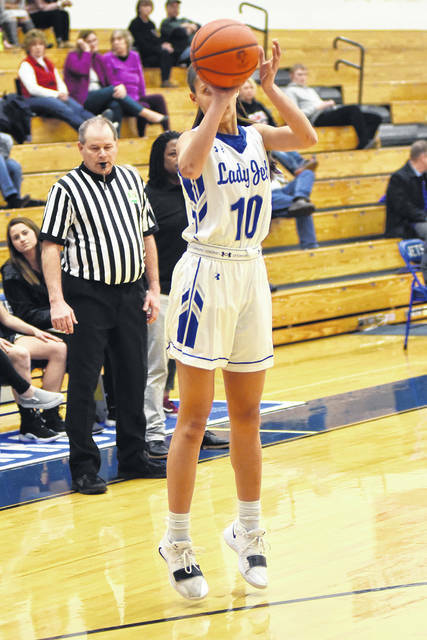 Just as there was a high moment in the game, there also was a low moment when senior Kennedy Morris went down in the third quarter on a layup attempt and appeared to be in serious pain. “There are so many emotions flowing right now,” Coach Moore said after the game trying to hold back tears when talking about her senior. “Kennedy has been with me every step of the way. It’s my fourth year here as a coach and she’s our only senior and a 4-year starter. To build a program off of her and for her to be there and do it with me, I couldn’t ask anything else, or better out of her. My heart breaks for her, the first thing we did after the game, we got together as a team and prayed for her. Hopefully tomorrow when she gets checked out it’s not too serious, but all we can do it is put it in God’s hands,” Moore said. “When I think about Kennedy I think about dedication and commitment. We’ve had highs and lows and she’s been through them all, for her to have that dedication and commitment makes me speechless, I’m so proud of her and all she’s accomplished. Moving forward I hope she can continue to experience more of the highs, because she deserves it, she’s been one of my hardest workers, and is always there, I just can’t say enough about her,” Moore concluded. The Lady Jets conclude the regular season with a 16-6 overall record and 10-2 in the CCC. The adversity for the Franklin-Monroe basketball team this season continues, but one thing is evident, they won’t quit. Their resolve is strong and no matter what happens from here, when they hit the floor, they will be ready to go. 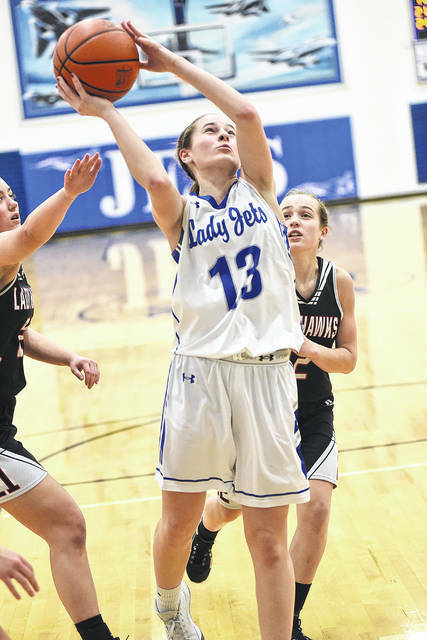 The Jets open tournament play in the Division IV Brookville sectional where they take on Dayton Christian at 2 p.m. next Saturday, Feb. 16. Mississinawa Valley: Alison Byram 3, Lindsay Johns 2, Olivia Murphy 2, Taylor Stachler 2. Totals 1-2-2/7 – 9. Franklin-Monroe: Skylar Bauman 9, Belle Cable 14, Corina Conley 22, Kennedy Morris 3, Chloe McGlinch 3, Stella Shellabarger 6, Chloe Peters 8. Totals 5-19-12/17 – 65.